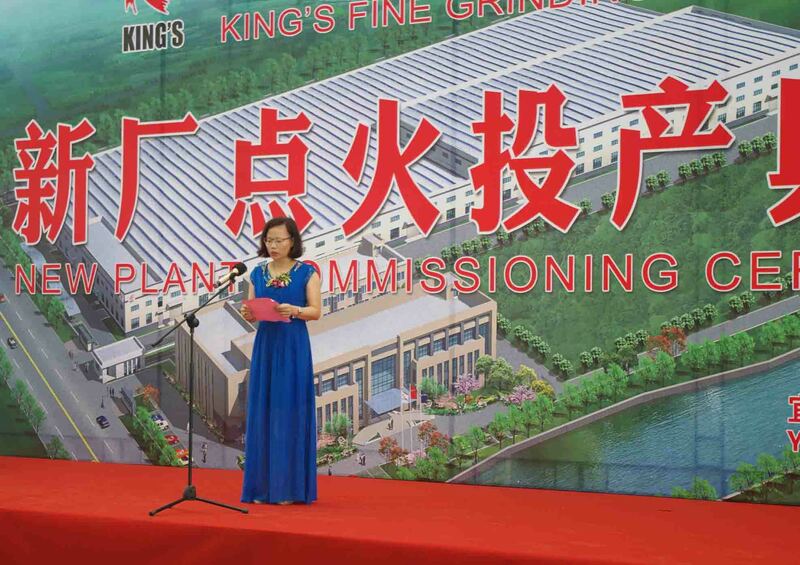 On June.18th, 2016, King’s Grinding Technology Co., Ltd. successfully held the Commissioning Ceremony in their new plant site, which is located in ceramic industrial park of Yixing city, Jiangsu province. More than one hundred people attended the ceremony, including Member of the Standing Committee and executive vice-mayor of Yixing city, Mr. Mei Zhonghua, general manager of strategy development department of China National Light Industrial Products Imp. & Exp. Corp., Mr. Zhou Hang, Party Secretary of CPC Dingshu Town and Secretary of the Party Working Committee of Yixing ceramic industrial park, Mr. Ma Zhong; and customers from home and abroad, representatives of suppliers, etc. Mr. Junfu King, general manager of King’s Ceramics Grinding Technology Co., Ltd, delivered a welcome speech and extended his sincere gratitude to the guests. Facing the dual challenge of old plant demolition and new plant construction after the relocation agreement signed in 2013, Mr. King and his team member has conquered all the difficulties before the establishment of the new plant. He expressed his gratitude to all partners for their understanding and support during the three years. 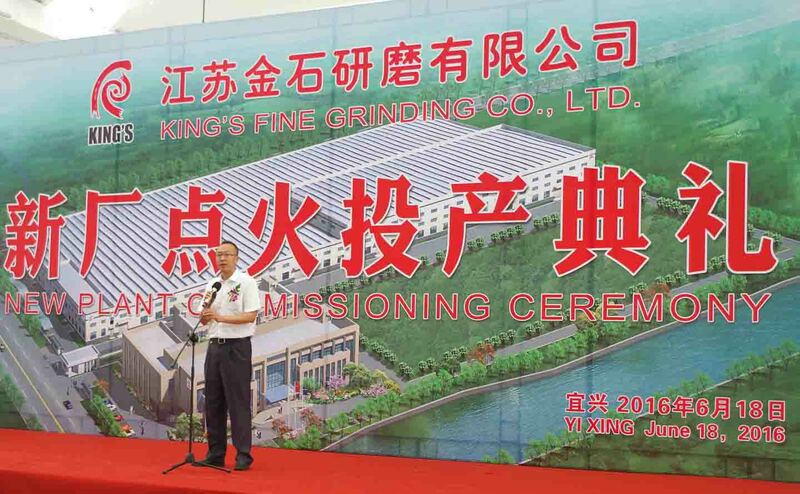 Mr. Junfu King said, taking this opportunity of the new plant’s commissioning, they would make unremitting efforts to achieve the vision of “becoming the best ultra-fine grinding team in the world”, with the joint efforts of King’s team. Representatives of employees, shareholders and customers from home and abroad, delivered their speech respectively. On behalf of the head office, Mr. Zhou Hang, general manager of strategy development department of the China Light Group, sent his congratulations to King’s on the commissioning of the new plant, and gratitude to the trust and caring from Yixing government, Dingshu Town, customers, partners, and associate organizations. He said, the successful case of King’s shall be promoted in China Light Group, and more potential projects should be introduced to Yixing city, thus deepening cooperation between state-owned enterprises and local businesses. 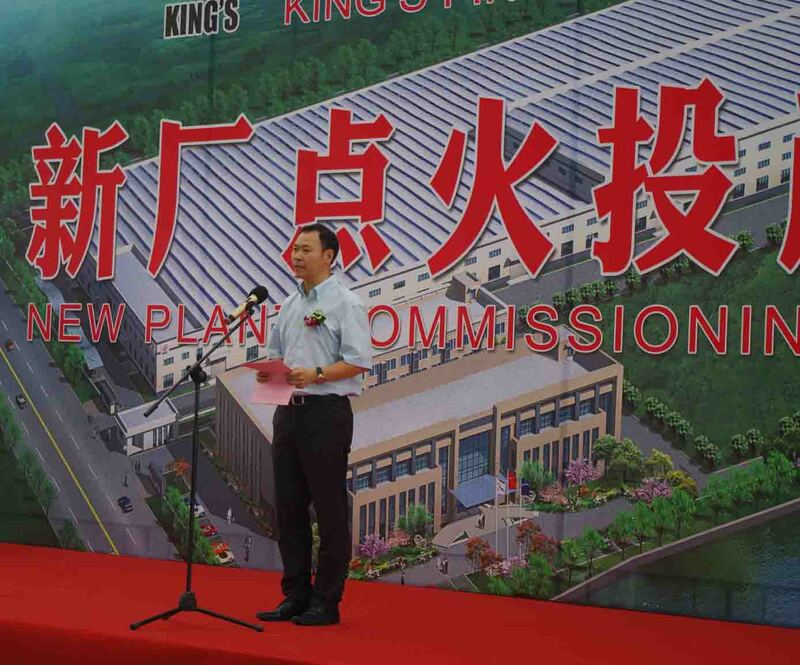 Afterwards, Member of the Standing Committee and executive vice-mayor of Yixing city, Mr. Mei Zhonghua, expressed his sincere congratulations to the successful commissioning of King’s new plant. He hoped that upon this new start of the commissioning ceremony, King’s could continue to uphold the objective of “building a world-class grinding media production enterprise” and create a brilliant future for Yixing ceramics industry through joint efforts. Finally, Mr. Junfu Kings showed the production line of the new plant to all leaders and guests, and ended the commissioning ceremony by firing the tunnel kiln together with Mayor Mei, general manager Zhou, Secretary Ma, manager Lin, and customer representatives. 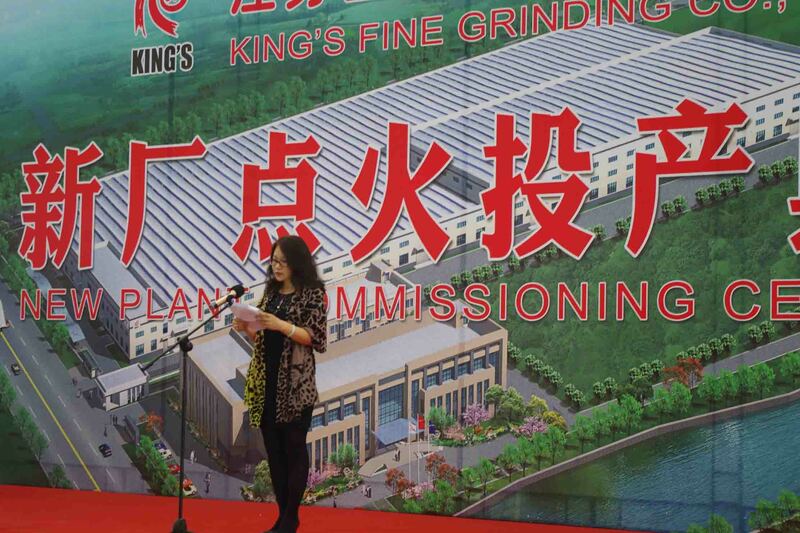 The New plant construction project of King’s Grinding Technology Co., Ltd., which was signed in 2013, is the connecting and cooperation project between Yixing government and China National Light Industrial Products Imp. & Exp. Corp. This project is also “the overall relocation project of production of high performance ceramic grinding media” of King’s. With the new plant located in Yixing ceramic industrial park, the total planned investment of this project is 320 million yuan, and are divided into two phases, with the first phase 220 million and the second 100 million. After the completion of the project, this plant will become the largest ultrafine ceramic grinding media production base in China and one of the largest in the world. This will greatly increase the supply capacity to the markets both domestically and globally. King’s will continuously deliver optimized and more reliable grinding media and technical assistance to customers all around the world, and spare no efforts to promote the upgrading of grinding technology.